Most people do not give this much thought, but when you first install WordPress, you get default media settings created for you. When you go to your Settings Media Screen in the admin, you will see various settings related to images and other media that are used in writing posts and pages. 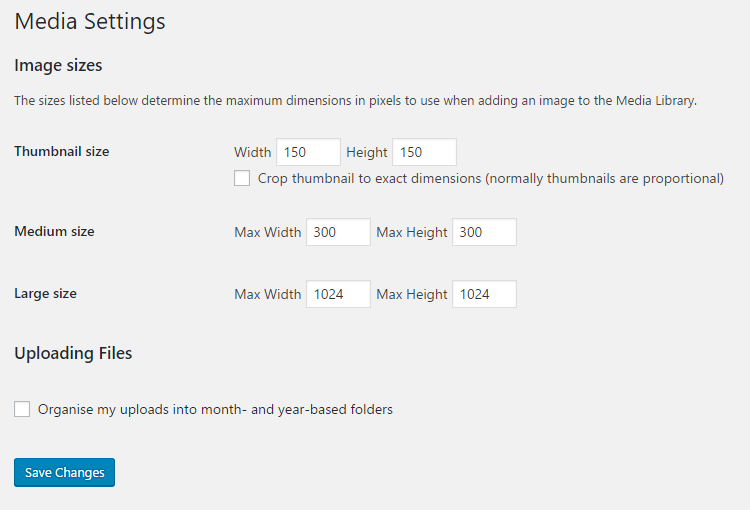 When you upload an image to your media library, WordPress will create extra images from the original based on the sizes you set for thumbnails, medium, and large…even if you don’t need those extra images. One thing to note, is that if your image is at least 1024 pixels in size, you will get all three, plus the original. But if your image is smaller than 1024 pixels, you will get the thumbnail and medium size only. The reason why we are talking about media sizes is to make you aware that every image will have extra copies of it in the different sizes that you set. This can be a problem if you do not intend to use the extra sizes because over time, your website uploads folder will start to get filled up with a ton of images. One of the biggest problems is when it comes to backing up your website, your back-ups will include all your uploads, including all the extra copies that never get used. The more you upload, the bigger your back-up archives will be. This can also pose a problem if your web host server starts to get too big to the point your host will request you pay for more disk space. This will of course be your choice, but I usually set each image size to zero (0) because I prefer to create my image thumbnail as I need them. This way, I can control what images are uploaded and what sizes. If you decide to set your own custom sizes, the Media Settings is the place to do it. You can change the default sizes to your own personal preferences. One exception to the method mentioned is when you use a theme that has custom thumbnail sizes added for the purpose of the theme design concept. So in addition to the default WordPress sizes, you may end up getting even more sizes generated because of the theme. Just something to be aware of.